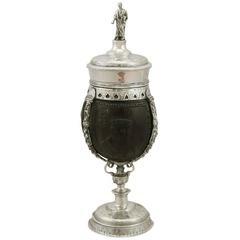 An exceptional, fine and impressive antique continental silver mounted coconut cup with nautical interest; an addition to our diverse ornamental silverware collection. 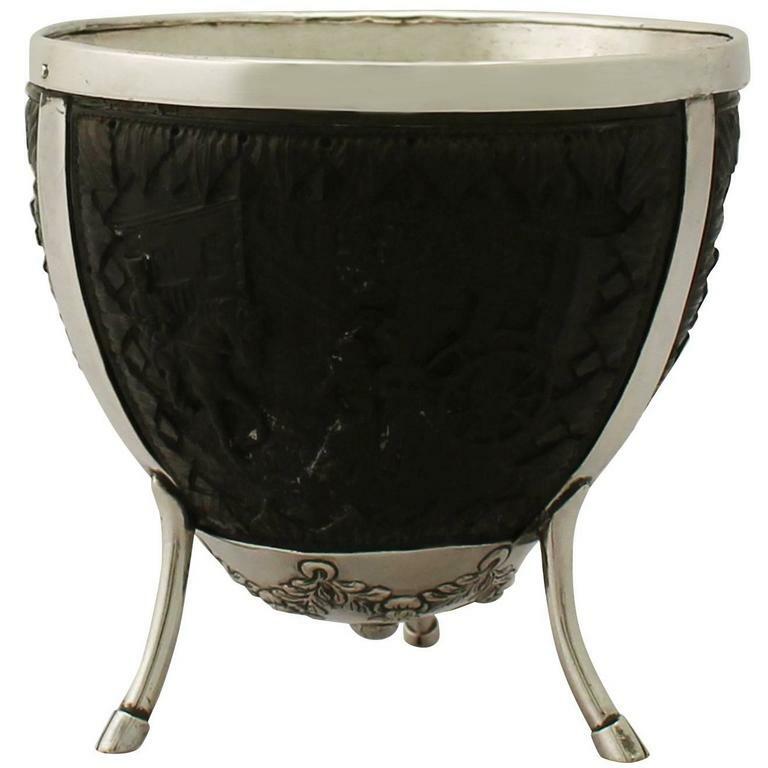 This exceptional antique silver mounted coconut cup has flared rim and plain waisted pedestal onto a circular domed foot. 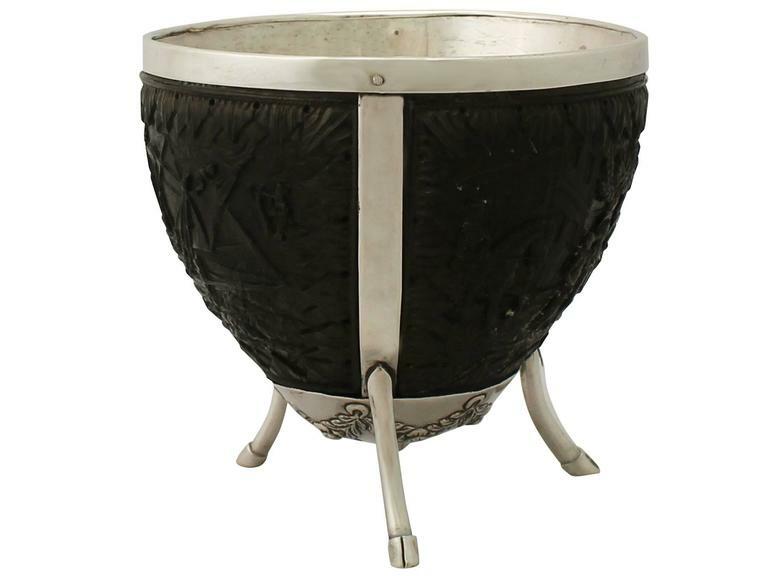 This antique coconut cup retains the original sterling silver mount and hinged strapping system securing the natural vessel. 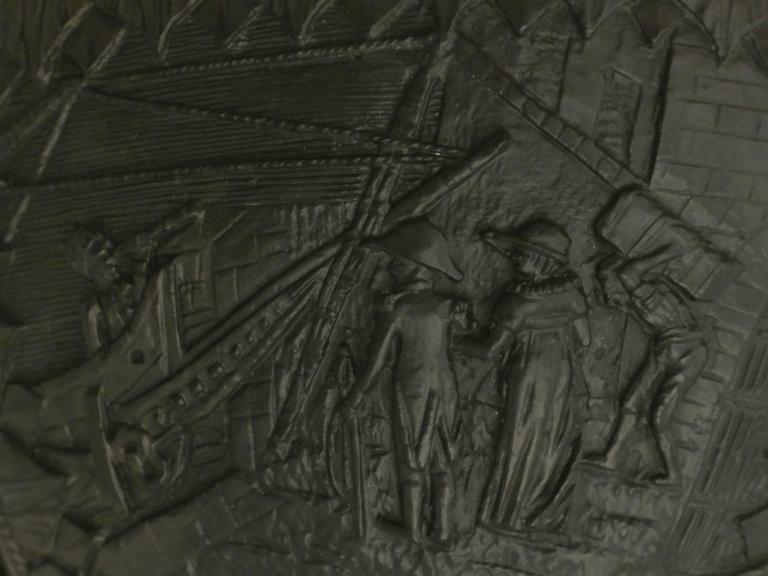 The coconut bowl is embellished with three exceptional carved panels depicting strolling figures on a dock, and two nautical scenes incorporating manned ships. 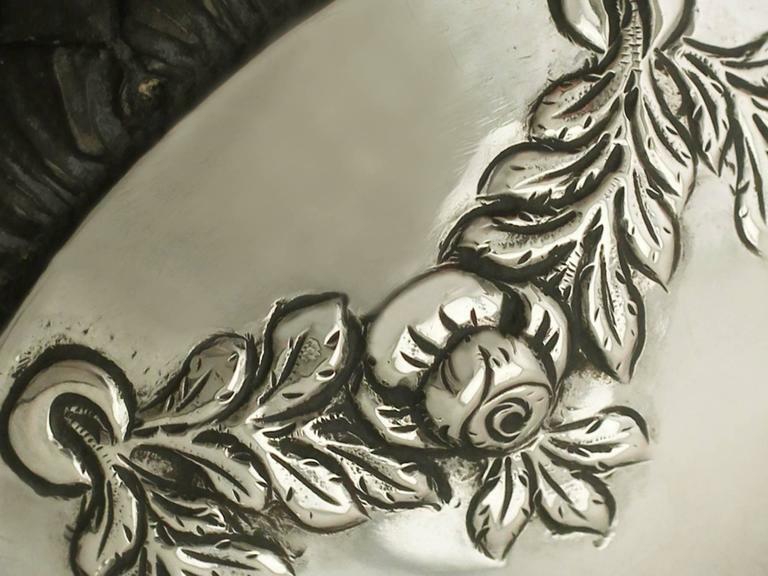 Each intricately decorated panel is encompassed with an incorporated carved layered leaf border. 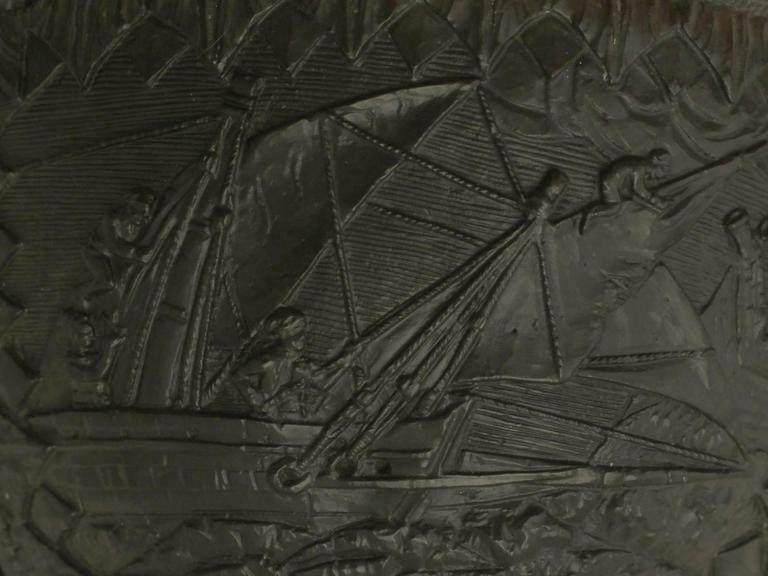 The convex silver panel to the lower portion of the coconut vessel is encompassed with an impressive applied array of suspended leaf festoons accented with a floral motif to the nadir of each. 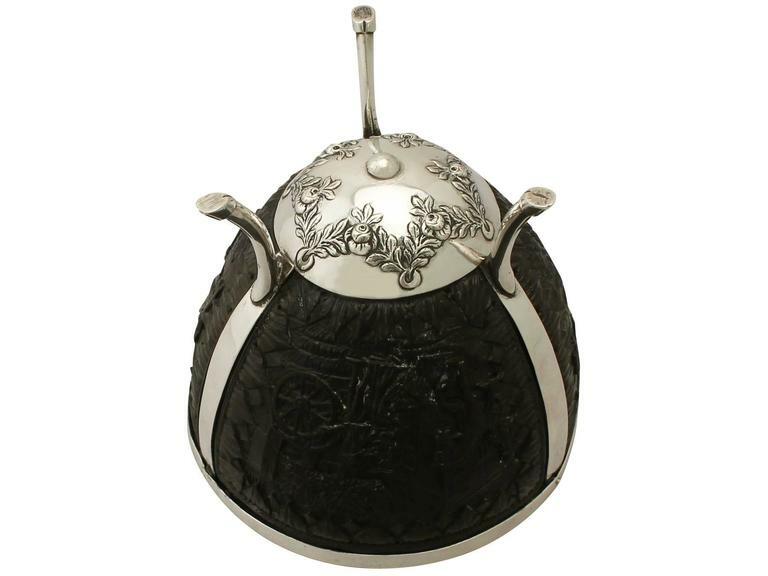 This antique cup is supported by three simplified hoof style feet; this style foot proffers an older appearance whereas the construction, condition and further ornamentation determines this piece was crafted, circa 1890. 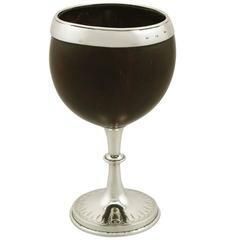 Note: Coconut cups were popular in the late 15th-early 16th centuries as it was believed that the shell of the coconut would act as a natural defence against poison. The shells shape and scarcity of the commodity enabled the wealthy to mount the shells in precious metals to allow them to be used as respectable and highly treasured drinking vessels. Dimensions: Diameter of rim 10.3cm/4.1". Width across feet 8.5cm/3.3". Height 9.6cm/3.8". 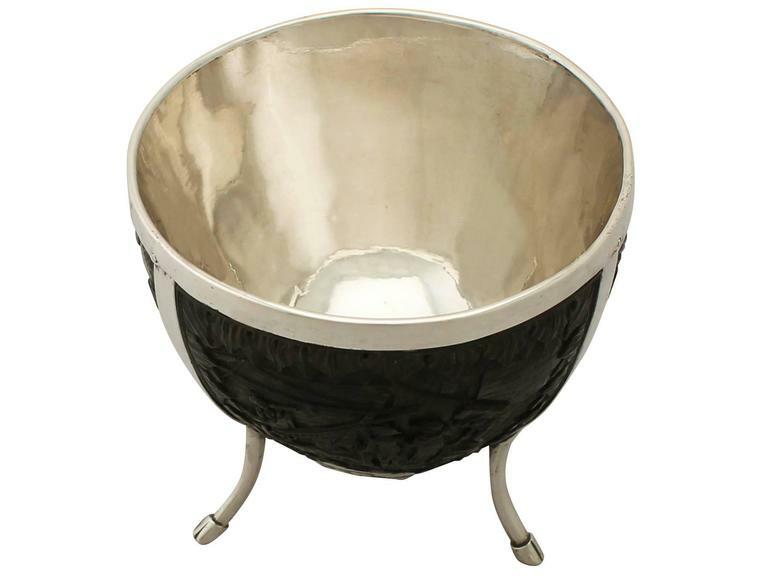 Weight: An accurate weight of silver cannot be provided as cup has a coconut shell drinking vessel. Maker: Unmarked. 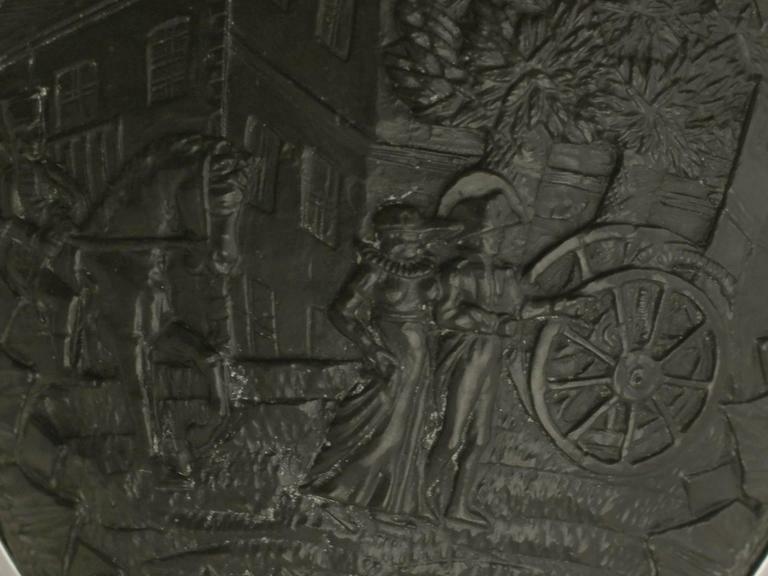 Date: circa 1890. Origin: Europe. Video: A video of this fine piece is available upon request. 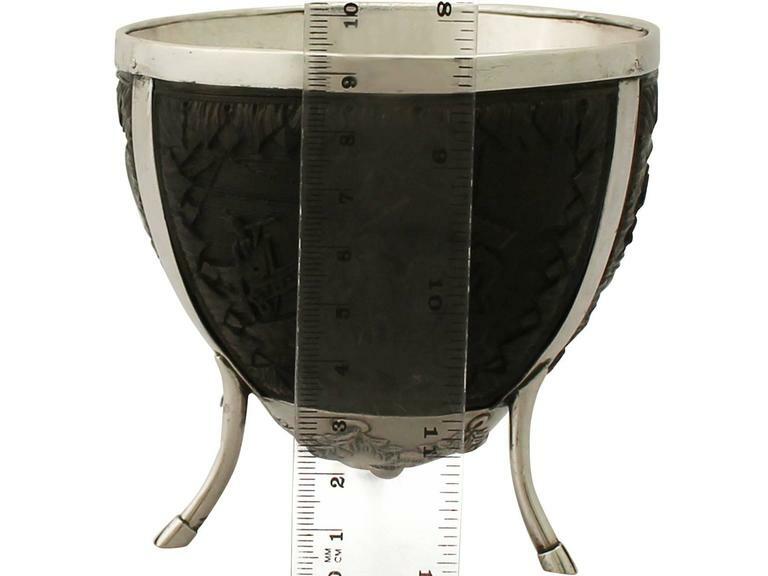 This mount of this antique coconut cup is a excellent gauge of silver, quality and condition. The coconut vessel is in perfect condition. The applied decoration is all very sharp. There are no hallmarks as often expected with such a piece. 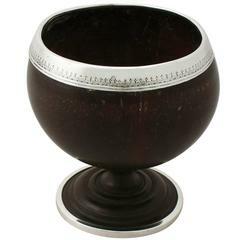 19th century English horn cup with silver mounts.